If SharePoint Application Pools are stopped that would cause "Service Unavailable" outages to your SharePoint environment! While SCOM can monitor SharePoint IIS web application's application pool status, it makes bit more noisy with alerts and doesn't start the application pool automatically - when stopped. So, lets address this issue with the help of PowerShell! Here is my nifty PowerShell script to monitor application pools on all SharePoint web front end servers. 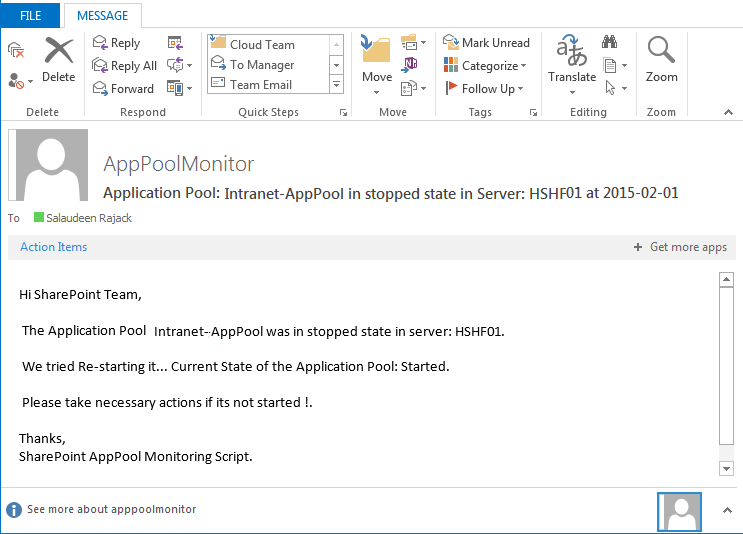 $now = Get-Date –f "yyyy-MM-dd HH:mm:ss"
$subject = "Application Pool: $($AppPool.Name) in stopped state in Server: $($Server) at $($now)"
$body = "Hi SharePoint Team, `n `n The Application Pool $($AppPool.name) was in stopped state in server: $($server). `n`n We tried Re-starting it... Current State of the Application Pool: $($AppPool.State). `n`n Please take necessary actions if its not started !. `n `nThanks, `nSharePoint AppPool Monitoring Script." Schedule this PowerShell script in Windows Task scheduler in any Application server (or any other server will do!) to periodically scan App Pool status, Say once per 5 Min! run interval can be adjusted based on your application priority.